Here's some preview what is planned for the next version. I've added a visual XMPP view / debugger, which helps you debugging and understanding the XMPP traffic. There are three tabs. The first one shows the connection and presence status. 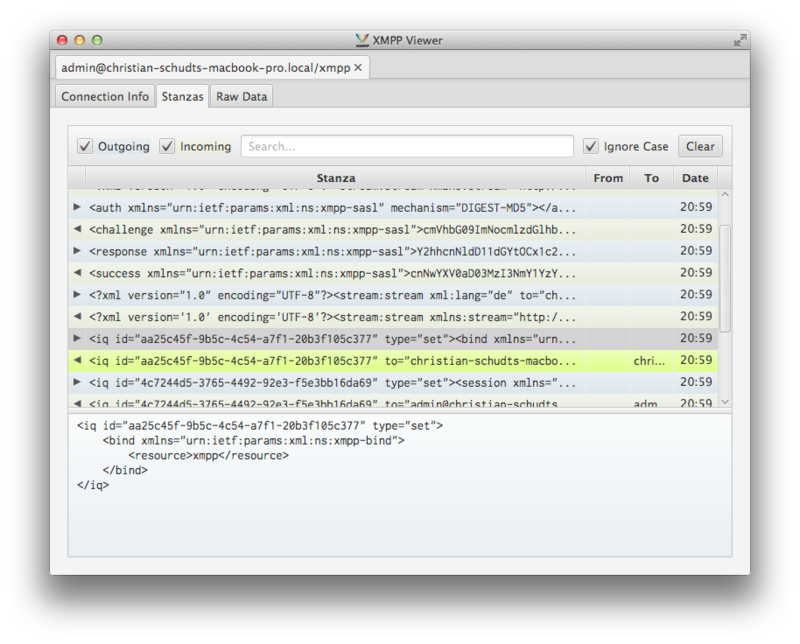 The second tab shows the XMPP elements being exhanged between the client and the server. This is probably the most interesting tab because you exactly see what's going on. There are also some neat gimmicks like filtering, searching and highlighting an IQ respone if you have selected an IQ request (as you can see below). The third tab is less interesting, it basically shows the raw traffic in two text areas one for the incoming and one for outgoing XMPP stream. // Enable debugging, so that we see something. 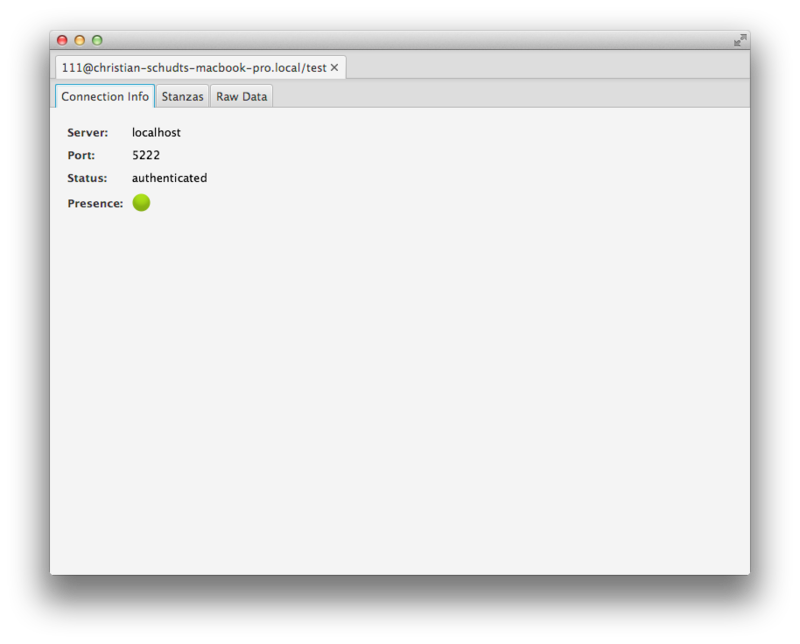 Babbler now uses Git instead of Mercurial. Admittedly I have no extensive experience with either source control system, but judging from my limited experience with both systems, I feel Git is more suited. In my opinion working with Git's branching model feels more natural, the tools for modifying history are better integrated (no need to install extensions) and the documentation is written more comprehensively. So, let's give it a try! The old Mercurial repository is still available here, but will probably be removed in the future. I am happy to announce the release 0.3.0. This time there have been added a lot of features with regard to file transfer. Read more about the File Transfer API. I also like to thank Georg Lukas who pointed out a security vulnerability to man-in-the-middle attacks, which got fixed with this release. Welcome to another blog post! It's been a long time since my last post and since the last version there have been two major refactorings which are now finished. There are also new features like Multi-User Chat support which have reached a status where they can be considered complete. Reason enough to release version 0.2.0! Let's have a look at the important changes. The first refactoring I am talking about is that Babbler has emerged into two modules: An "xmpp-core" module which mainly consists of mappings between Java classes and XMPP and an "xmpp-client" module for XMPP client functionality, which implements "real" business logic for clients. The reason for this separation is simple: I wanted to have an "xmpp-core" module, which could serve client and server implementations alike, at least theoretically. Its purpose is comparable to Tinder, but it's much cleaner, more complete and doesn't have the "jivesoftware stamp" attached to it. Besides mapping to XMPP stanzas and extensions it also provides a few utility methods and classes, e.g. 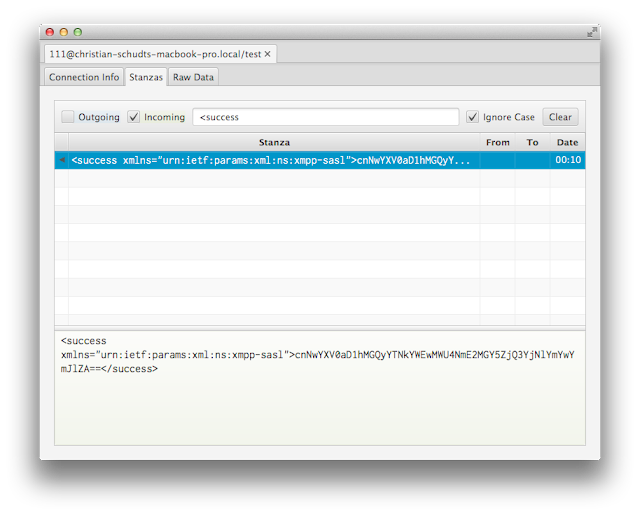 for generating the verification string for Entity Capabilities. If interest arose, it could now be easily provided as own library, similarly to Tinder. Cool, isn't it? Especially, that it sets the correct namespace for the inner message, but doesn't set it for the outer message (since it's the default namespace there). The second major refactoring was the concept of using an "XmppSession" instead of a "Connection". 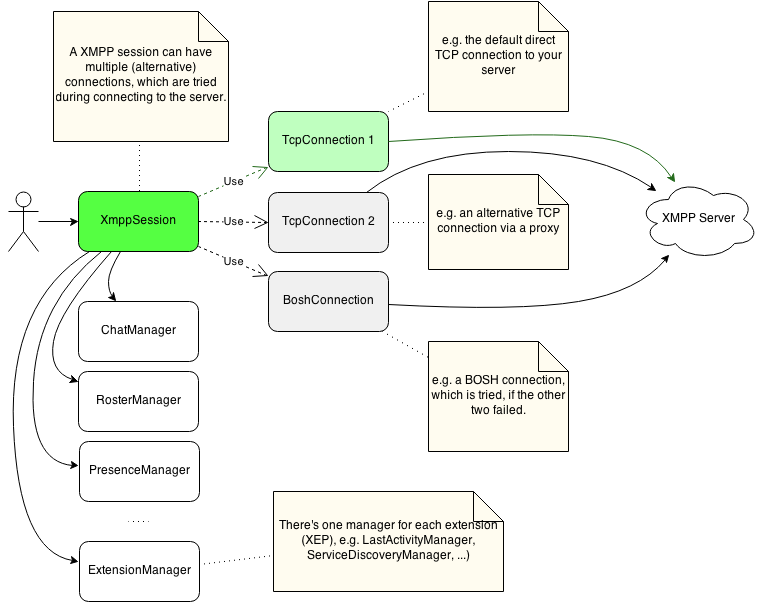 The session can have multiple connection methods which are tried during establishing the XMPP session. If connecting with TCP fails for some reason, the session can try alternative connection methods such as BOSH as fallback. Besides these major refactorings, there were other changes in form of new features, improvements and more documentation. One of the major addition is the Multi-User Chat support. In my last blog post, I've also announced support for Real-Time Text would find its way into 0.2.0, but unfortunately it's not yet finished. 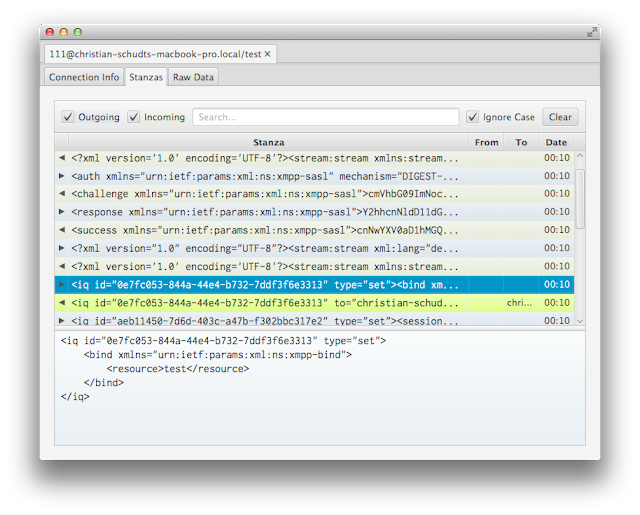 You can find the changelog and documentation on the project site. That's it for now, I hope you like it. If you have something to say, just leave a comment! During the last weeks there were still a lot of movement and changes in the API and package structure, but big changes have calmed down lately, so that I decided to publish a first beta release 0.1.0. I want to use Semantic Versioning for this library, hence a 0.1.0 release "is for initial development. Anything may change at any time. The public API should not be considered stable." Babbler meanwhile supports a lot of extensions. I consider most of them quite stable, also some of them (like XEP-0060 Publish-Subscribe) need more work and improvement. The meanwhile more than 600 units tests ensure software quality. I've also put some work into implementing SCRAM-SHA-1 authentication, which isn't available out of the box in Java, but is required by XMPP (interoperability tests against server implementations must still be done). Besides for the omnipresent need for good documentation, I am planning to implement XEP-0045: Multi-User Chat and maybe XEP-0301: In-Band Real Time Text as next (big) extensions for the future, while also keep working on PubSub/PEP and refining some other areas. One thing I've also thought about is, that one could split the project up into different libraries, because all the plain simple "XML Schema implementations" or e.g. the JID implementation could also be reused by a server implementation. But that's also something which can be considered in the future. If you have any suggestions or ideas for improvement, let me know, they are highly appreciated! Project site and documentation now available! Today I've uploaded a project site and some documentation for the project, which is now available here. Babbler is still in a quite early stage, but it's slowly shaping up. There have been numerous XEP's implemented during the last weeks and I am planning to implement more. Once it's mature enough and I have a better overview over the XEPs and their interdependencies, I am planning to release a first version. Until then, there's only the source and some snapshot builds for you. If you have any feedback of any kind, e.g. on the project itself or especially the API, let me know!